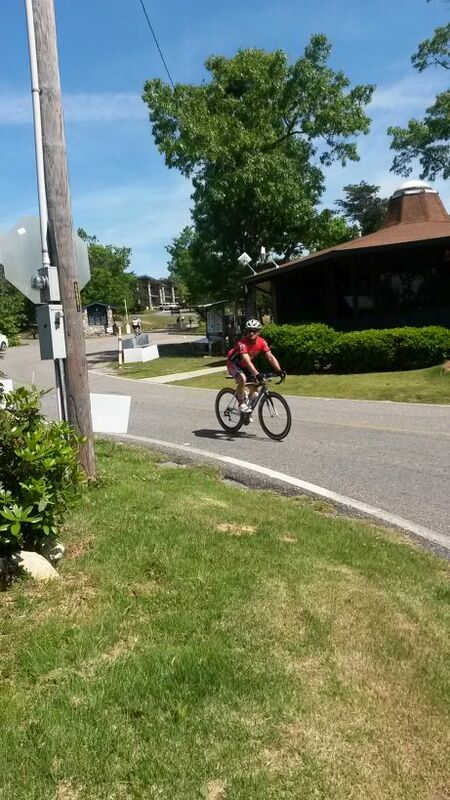 I was asked to volunteer for this year’s Cheaha Challenge bicycle race. 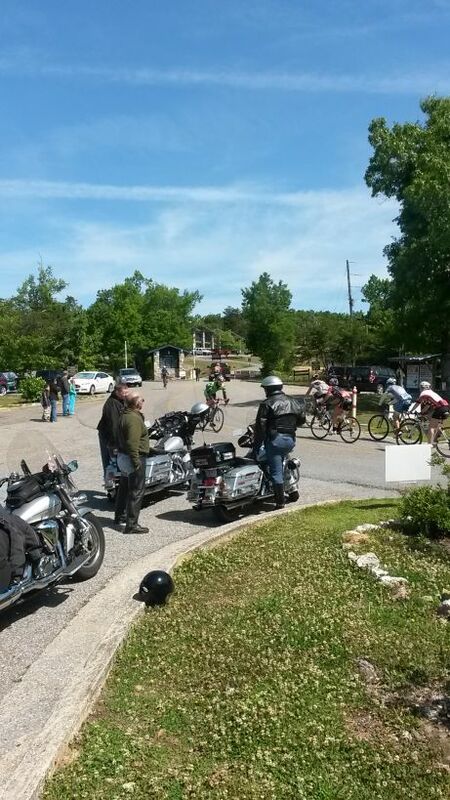 Over 100 Elite and Century riders came our way at Cheaha SP, Alabama. One of the groups/packs of riders coming up the hill. Two of the motorcycle State Troopers and more bicyclers. The cyclists followed the road to the right, went up a 3% grade, turned left onto Tower Road, went a short distance, then sharply down and to the right. Then left and out the park. The store and campsite registration is off to the left of this photo. One of the riders exiting the park. The building to his left is a museum. Here is what I basically did. I arrived Thursday morning. I wanted to camp out and get away from the relatives for a few days. Picked out the semi-primitive camp site I wanted and went back to the Cheaha store and paid for my 4 nights. The weather foracster said ‘rain late Thursday’. So I felt it would be a good idea to have my tent up and the rain fly installed before it rained. So I checked the site I had selected and found a spot fairly free of small and large rocks. I cleared many of the other rocks out of the way. I failed to check for slope of the location I picked… more on that later on. Got the tent up while ravens flew overhead looking for shiny objects and food left out. I could hear other birds, but didn’t see them. No, I have no idea what birds as I am not good at bird identification. About 11 AM, while sitting in my folding lawn chair, I heard thunder off to the west. Then off to the south. I got into my tent. A few minutes later I hear the beginning pitter pat of rain onto the trees. Lightning got closer to Cheaha Mountain, but not close enough for me to worry about a strike. Otherwise I would have retreated to my car. I ate snacks and some cheese/sliced meat with flour tortilla so I didn’t have to cook in the rain. Late Thursday night the lightning hit on the mountain, I jumped, but I didn’t notice any damage on Friday. In between the rain storms, two squirrels attempted to lift the wooden lid on the trash cans… it weighed more than they did. One gave up and left. Appaently the squirrel that kept at it must have invited the other one to dinner, and when the top wouldn’t move, the invited squirrel left. The first squirrel kept at it for several more minutes, then the rain picked up again. The squirrels left in different directions. Maybe it was a date ? Snacks for breakfast, lunch was more sliced cheese and meat on a flour tortillia with regular mustard. I drove down to the Cheaha store and bought ice cream. It was delicious. Particularly in the heat. Nice rocking chair near the store. Supper, I tried to heat water. Some of the jets acted clogged, so I got a yellow flame, not a blue flame. I presisted and eventually boiled the water. The MH Rice and Chicken is fairly good. Much better than the scrambled eggs they sell. I went to bed about sunset. One of my goals was to cook, eat, and take my trash down to the critter proof trash can so I animals wouldn’t be attracted to me tent. Barely room for me in there anyway. On Friday, one of the other campers in the semi-primitive area turned on a CD player or radio. Sigh. I came out there to relax, not listen to music. So I listened to Youtube for 10 minutes. Later on the turned off their radio/CD player. Saturday was much nicer, but hot. Partly cloudy. Same meals and same stove problem. Sunday morning, 47F at Cheaha. And windy ! I got a blanket out of the car. Slept a bit warmer. Maybe I need a better blanket. I volunteered to help with the Cheaha Challenge from 7:30 AM until relieved. So, I grabbed some of the gear I would need, put it in the car, and drove down to the store. I got in place. The start line was at Jacksonville, AL. We waited and waited. Then two motorcycle State Troopers arrived and told us the cyclists were right behind them. One guy comes by, we direct him up the road for the Cheaha Mt. climb, 3% grade, then back down to us and turn right down to Adams’ Gap. He calmly does it. Five minutes later, a small group of 10-15 cyclists comes up the road and makes the same turn. Kevin and I had heard earlier on the 2 meter radio that 120 Elites and Century riders would be coming our way. 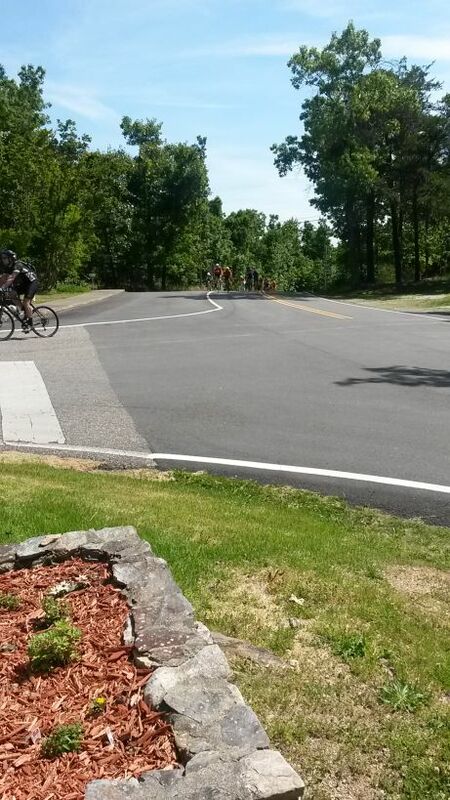 We were also the turn around point for the 88 mile riders who turned left out of the state park and turned left. Heading back to the finish line in Jacksonville, AL. There were honey bees collecting nectar from the clover flowers around our feet, so we had to be careful and not step on one of them. We did have a bit of confusion as the Elites and Century riders had to come back up the highway, and go back up Mt. Cheaha for a second time ‘up the loop’. Some cyclists didn’t know they had to do this a second time, not liking the first time they had to do it. We still had cyclists arriving for their first trip up the mountain and do the loop. That is where the confusion came from. Some started to do the trip down to Adams’ Gap a second time, but we and other riders managed to clear things up. Two riders were on the 62 mile trip, and didn’t know they had missed their turn around until we said, ‘after exiting the park 88s turn left and elite centuries turn right’. Oops. But they took it in good humor and headed back to the finish line. We were released after 3 PM from our safety duties. We had fun, eventhough it was quite hot that day. Sunday night I tried cleaning my stove, but it wouldn’t clean up and work correctly. So I didn’t use it for supper. It was 50F on Monday morning. I packed up, took down my tent, and went to the store to let them know I was leaving. Stopped down the highway and ate breakfast, went home and did laundry. Relaxed.